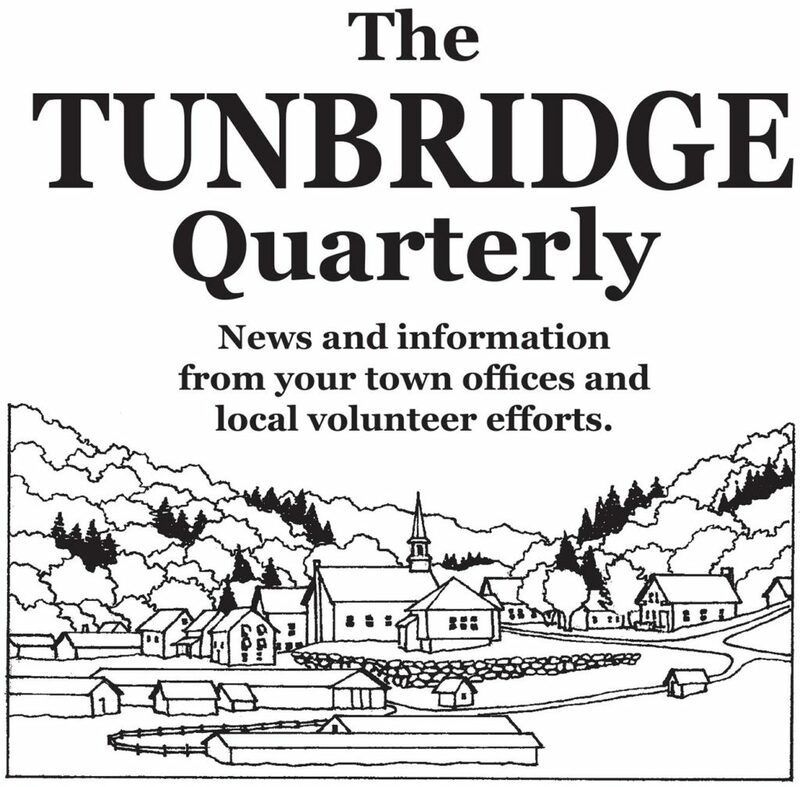 The TUNBRIDGE Quarterly is mailed four times a year to everyone that owns property and/or resides in Tunbridge and contains news and information from town and school officials and local volunteer efforts. The brainchild of Tunbridge resident Janet Zug, its first edition was published in July 2005 and has been curated by Janet ever since. Published April 1, 2019 – follow this link to see past issues. If Town Meeting was a race car, this year, it would have left our Chair and his number 29 Mustang in the dust. With historic swiftness and much agreement on the articles, the Tunbridge voters passed the Selectboard budgets (General and Highway), elected officials, took up not one non-binding resolution, and adjourned before lunchtime. That was first, according to Moderator Euclid Farnham, who has been wielding the gavel for over three decades and announced that this will be his last year. Behind a translucent plastic curtain, the Town Hall kitchen continues to be transformed into a thing of beauty and utility by veteran Tunbridge contractor, George White. George is shooting to complete the renovation by early to mid April. We doubt that the remodeling will make the Rec breakfasts or Super Senior lunches even more delicious, but the volunteers who make those feasts happen should find preparation, cooking, serving and clean-up a good deal easier. It’s now up to Tunbridgians to appreciate this resource and take care of it for the next generation. Between the writing of the TQ and its publication, there is a lot of mud season to be endured. Its opening salvo was a doozy. After one day in March that reached 60 degrees, many mufflers and splashguards were physically separated from their customary homes on automobiles. Blakeman’s towing rescued many a car from a bottomed-out immobility. “This is the second worst mud season I’ve ever seen,” was overheard by the clerk, who thought to himself, “Well, it’s only mid March—we can still be number 1!” While the battle of the back roads is being waged by our Road Crew with experience and hardpack, Vermont Route 110 is beginning to look like something you’d find in Albania or Macedonia—although that might be unfair to the masters of macadam in the Balkans. Anyway, Route 110 is the responsibility of the VTRANS. Don’t blame Rodney for the bumps, pot holes, frost heaves and miniature San Andreas faults that you might meet on that byway. On March 14th, it was Tunbridge’s turn to host the “Our 4-Town Future” evening. This series of forums has been organized by the Vermont Council on Rural Development (VCRD). Each of the four towns involved –Royalton, Tunbridge, Strafford, and Sharon–invite the 4-townspeople over for a night of good food and wide-ranging conversation about our post-New Vistas possibilities. After soup and stew, the 150 or so attendees split up to discuss either “Agriculture and Forestry,” or “Attracting and Supporting Young Residents and Families.” The night was a success, but also embryonic –going forward, the plan is for VCRD and its team of facilitators to help the four towns transform ideas and enthusiasms into priorities, and then those priorities into realities. In our immediate town future, we have two priorities: to paint the Town Office roof, and to rework the Town Office computer network. With the Town Clerk, the Treasurer, the Administrative Assistant, the Listers, and the Auditors all in need of reliable data storage and retrieval, as well as high-speed internet, it’s time to re-boot our maxed-out system, some of it dating to a time when George W. was President or Miley Cyrus was Hannah Montana. Translation: Thanks for the memories, but it’s time to move on. There is an effort underway to create another Community Phonebook. This edition will cover Tunbridge, South Royalton and Chelsea. Cell phone and land line numbers will be included and advertising space will be sold. This is a monumental task that will take time to complete. To be included in the phonebook please go to the website: www.firstbranchphone.com and input your name and telephone number(s). If you check the corresponding box I will contact you about advertising in the book. The deadline dates for entries are the 15th of December, March, June and September. Entries are printed as received and only edited for typos. Feel free to contact me with any questions, comments or suggestions. The Annual School Meeting was held on March 4, 2019 at the Tunbridge School Gym, with 60 Tunbridge residents attending and 30 Chelsea residents. The new combined First Branch Unified District School Budget was passed. The Annual Tunbridge Town Meeting was held on March 5, 2019. 166 voters checked in. According to our Moderator, Euclid Farnham, the meeting was our shortest ever, adjourning at 12:05, even slightly before the lunch was ready to be served. The majority of Town Officers remained the same, with Gary Mullen returning to the Selectboard, Elizabeth Sponable returning as Town Clerk, Rebecca Hoyt returning as Town Treasurer, and Jola Brock returning to her Lister position. Judie Lewis, Lenora Kimball, and Baxter Doty were all re-elected to their respective positions. We will have several new faces, as Liz York was newly elected as Trustee of Public Funds, Carrie Cooker and Fern Strong were elected as Library Trustees, and Anissa Morrison was elected as Auditor. The Selectboard will be appointing two new Constables, so if any of our residents are interested, please contact one of our Selectboard members or their Administrative Assistant, Jillian Conner. You will find all of these updates on the Tunbridge website. 2019 Dog licensing commenced on January 1st. You may license your dog until April 1st without penalty, after that time a late fee will assessed. Cost per license is $9.00 spayed/neutered; $13.00 for non-spayed/neutered. After April 1st, there is an additional $2.00 late fee for spayed/neutered dogs and $4.00 for non-spayed/neutered. You may renew your dog licenses at the Town Clerks Office, or by mail. Please be sure that your dog’s Rabies Vaccination Certificate is up to date. Town Hall renovations are well underway, so please check with Judy Howe at (802) 889-3487 prior to scheduling your event, especially if you will need access to the kitchen. Lila Caroline Porter, born January 29, 2019- to parents Sarah Faith Priestap and Jeffrey Thomas William Porter. * Please note that even if one of the above events includes a Tunbridge resident, but occurs out of Town or State (particularly in the event of a death), a record of that event is not necessarily recorded here in Tunbridge. We may or may not receive a courtesy copy from the location it did occur. Green Up Day this year is May 4th! Our coordinator is Ed Howe- 889-3750. Green Up bags will be available in the Town Clerk’s Office as we get closer to the date. Spring is finally here. I think. I’m sure we are all more than ready. As the snow continues to melt, be careful out there. This mud season is starting out to be a difficult one. TNHN provides needed services to residents through volunteer actions and acts as a coordinator for volunteer efforts. There is no charge for any service. Neighbors Helping Neighbors is a non-profit organization with donations the only source of income. Our major expense is maintaining a telephone to receive and forward calls for help. Donations to help with telephone expenses would be gratefully accepted. Please mail to Neighbors Helping Neighbors, Box 2, Tunbridge, VT 05077. Thank you for appropriating funds at town meeting for this very important service to our town and thank you to those who have donated. Anyone needing help with something should call 889-3437. Someone will take your request and try to find a volunteer who can do it. The Neighbors Helping Neighbors phone line is not answered 24 hours a day; you should leave a message stating your request. One board member is responsible for taking the calls each month. When a message comes in, that board member will start calling volunteers until a volunteer can be found for that specific request. We do the best that we can to find a volunteer who is available for that specific request at that specific time and date, however, this is not always possible. Therefore, we need sufficient lead time to call around and if we cannot find a volunteer, this gives us enough time to notify the individual calling that we were unable to comply with that specific request. If you want to volunteer, please contact any of the board members or call 889-3437 and we will put you on the list. You may then be called from time to time. No one is going to be asked to do something week after week. Let us know if there are particular things that you might be able to do. Thank you for those new volunteers who have signed up in the past few months. Board members: Pam Dietz, David Wolfe, Michael O’Donnell, Patricia Howe, Jory Innes, and Maxine Young. HOMESTEAD DECLARATIONS AND HOMESTEAD PROPERTY TAX ADJUSTMENT CLAIMS ARE DUE APRIL 15, 2019, even if you anticipate filing an extension for income taxes (adjustments can be made later and still be considered timely if you file by April 15). Tax preparers sometimes need to be reminded about the Property Tax Adjustment claim in particular, especially if they are out of state. The Property Tax Adjustment Claim for 2019 is due April 15 and no later than Oct. 15. There is a $15 late fee after April 15. We received the results of the annual statewide sales equalization study in late December 2018. Tunbridge now has a Common Level of Appraisal (CLA) of 105.97%, a continued drop from a peak of 116.38% in 2016 (our last town-wide reappraisal, when the CLA by definition was 100%, was in 2010). The CLA helps equalize sales values across towns for purposes of leveling education tax loads (https://tax.vermont.gov/property-owners/understanding-property-taxes/education-tax-rates). The Coefficient of Dispersion (COD) is a measure of equity within the town. A COD of less than 10% is considered indicative of a high degree of equity within town. This year our COD is 13.23%. We are mandated to do a town-wide reappraisal if our CLA drops below 80% or our COD exceeds 20%; neither of these thresholds applies in Tunbridge this year. A CLA over 100% indicates that property in town is generally listed (assessed) over the statewide statistical estimation of fair market value. Education tax rates are divided by the CLA; if the CLA is over 100%, the education tax rate is adjusted downward (as will happen in Tunbridge this year). The sales study includes valid sales from a moving window of the last 3 years. In 2018 this window included 48 valid sales, reflecting a continued upward trend in the last three years in Tunbridge. We are working on our northeast corner rotational visits and photo updates, as well as trying to assess any new construction or other significant changes in any part of town. We will move on to the southeast quadrant rotational visits come summer. Our deadline for assessing property for the 2019 Grand List is on or before April 1, 2019. Any transfers we receive on April 2nd go on the 2020 Grand List. Feel free to stop by or give us a call with questions. Thanks to those who have attended our 2019 Friday Night Tunbridge Grange Bingo season; we hope you all had fun! The next Tunbridge Grange event will be held the evening of Saturday, April 27th. This will be a Pot Luck dinner and a “Pound Auction” night at the Tunbridge Grange building in North Tunbridge. Please consider bringing a potluck item and something that weighs approximately one-pound to be auctioned off. The item(s) should be hidden in a bag and bidders take their chance on what is inside. This is something similar to the surprise grab bags that many of us remember begging our parent’s to buy us when we were kids! Dinner will start around 6:00PM, followed by the auctioning of the pound bags. The Grange will furnish beverages and eating utensils. The Grange will donate the auction proceeds to the annual Tunbridge 8th Grade Class Trip. This should be a very fun night for all – young and old, so come to support our Tunbridge students! The Grange supports local community members in need. We meet the first Wednesday of the month at 7 PM and the meetings usually only last about an hour and then we have good conversation and snacks! Please consider joining the Grange so we can continue to keep this worthy organization going. For more information, contact either Marilyn (Mert) Vesper at 889-5595 or Rosemary Distel at 272-2235. Your library is your place to work, study, read, or just catch up with friends and neighbors. We hope you stop by and see what’s new this week, and let us know how we can be more helpful to you. Regular events at the library, include a Chess Club led by Philip VanDusen every Monday from 4:30 to 6:30, as well asd a Gathering of Fiber Artists from 6 to 8 pm first and third Wednesdays (April 3, 17, etc.). Any age and ability are welcome in either group. Story Hour for families with children of all ages continues to help us “Try Something New” on Saturday, April 6 at 9 am (“Being Brave”) and Saturday April 20 (“Knitting”). After this, we’ll be getting ready for a bunch of great Summer Library Activities with the theme “A Universe of Stories.” Get ready for everything from searching for buried treasure, uncovering forgotten history, and searching the sky for constellations. Stay Tuned! The current ArtSpace exhibit is “Wood-Burning,”—a collection of artwork by local artist Tom Ball touching on his interests, including remarkable pieces reflecting his style and work as a tattoo artist. This show will be on display until May 3. Look for a new exhibit going up in May with oil paintings by artist Jean Gerber of Thetford. Remember, the Friends of the Tunbridge Library continue to brainstorm ways for your ideas, talents and energy enrich the programs and offerings at the library. Are you interested in volunteering at the library, or joining the upcoming fundraisers to support the library? Reach out to us at the library, or look for upcoming Friends meetings in the weeks ahead. Tunbridge’s town website is a timely resource for information from the Town Clerk, board meetings, upcoming events and past issues of the Tunbridge Quarterly. Please let us know if there’s something you would like to see listed, or have any questions. The Better Bones program offers five free weekly sessions for adults: Mondays at 10 a.m. and Tuesdays and Thursdays at 6:30 a.m. and 5 p.m.
Linda Howe leads Monday’s Better Bones with Music class. It is designed to strengthen muscles and improve coordination while participants get a cardiovascular workout, strength training and stretching. The other sessions offer balance and weight-bearing exercises aimed at increasing bone density at an age when bone mass is lost and many people become susceptible to osteoporosis. All sessions are upstairs at the Town Hall. Anyone can drop in and try it out. A doctor’s permission is requested for those who continue with the classes. Tunbridge seniors are invited to attend noon congregate meals on Mondays and Fridays at the Chelsea Area Senior Center in the United Church of Chelsea on the North Common. Meals on Wheels delivery in Tunbridge is available those days. The Senior Center, which is affiliated with the Central Vermont Council on Aging, serves residents of Tunbridge, Chelsea and Vershire. It offers entertainment, health speakers, blood pressure clinics, foot clinics by appointment, trips and fundraisers. Local women are invited to send their email addresses to Elaine Howe at elaineahowe@gmail.com to receive Tunbridge Women’s Group (TWG) mailings. In addition to sharing community news through occasional emails, the women’s group hosts monthly potluck suppers in local homes. This is an informal group without officers, committees and duties that offers women a chance to meet each other and share conversation and information about their interests. Calling all gardeners. It soon will be time to replace, divide and move plants and freshen houseplants. The annual Memorial Day plant sale depends on donations. If you can share some plants, or have plants to be dug or moved to the library, or need pots, please contact one of the people listed below. Information about type of plant and variety is requested. Library Friends Memorial Day sales will begin at 9 a.m. Baked goods and beverages will be in the Town Hall. Plants will be on the library lawn. Used books for all ages in many categories of fiction and non-fiction, plus free and name-your-price books, will be in the library basement. New books, cards and gift items will be sold upstairs. The library depends on friends with many talents who can help at the circulation desk, shelve books, make program refreshments, and assist at special events like Memorial Day. If you sit on the porch with your laptop, attend story hour, read magazines, visit art shows, take out movies and books, attend Winter Evenings, use the computers or donate sale books you are a library friend. Thanks to everyone who baked pies and donated food items for the Town Meeting dinner, the diners, and the helpers who set up, served and cleaned up. For more information contact Elaine Howe, 889-5560, elaineahowe@gmail.com; Kay Jorgensen, 889-5528, kjayvt@gmail.com; Donna Nelson, 889-5642, donnanelsonvt@gmail.com; Ben Wolfe, benjamin.m.wolfe@gmail.com. As I’m sure most of you know, the barn area of the fairgrounds suffered severe flooding in January. We can’t be sure the extent of the damage until the snow and ice finally melts. Single- $25, Couple- $50, Family- $100, Lifetime- $1000 (may be paid over 3 years) Additional information is available on our website at www.friendsoftunbridgefair.org. Meetings are held in the basement of the Town Hall starting May 8th at 7pm and continuing the second Wednesday of every month through November. All meetings are open the public. We hope to see you there! Spring is on its way…and with it the time of the year with the most reported fires in our state. By far, debris burning is the biggest cause of fire calls this time of year. So don’t forget as soon as there is no snow surrounding your grass or wood burning, by state law you need to obtain a “Right to Kindle Permit”. I get an early morning report each day from Vermont Forest, Parks and Recreation with a lot of info about the dangers or lack of to assist with our decision regarding granting that permit. You don’t need to pick up your permit but we do need our copy. IF your permitted fire did happen to get away from you and the fire department is called, well it goes over a lot better if you have a permit and maybe that wind just surprised all of us later in the day. It happens. Without a permit, the costs of suppression and damage could be on you if it is deemed a willful violation of state rules. Expect both John Durkee and myself to be a lot more cautious granting permits in the spring and dry seasons. Remember burning garbage, plastics, treated wood products, wires, building debris (you get it) are a special restriction under the Air Pollution folks. They even have an office, unlike myself. As a Fire Warden I deal with grass, untreated wood, leaves, brush, logs, trees, all the natural fun stuff. Be safe, call if you have any questions and remember to rake those woods. The Alliance for Vermont Communities (AVC) continues to work to steward and protect our region to support healthy communities. AVC welcomes your ideas, support and engagement. We are excited to report the 4 Town project for Strafford, Sharon, Tunbridge and Royalton has begun! A Steering Committee, formed from Selectboard members and a varied group of residents from each of the four towns, met on January 17th at Barrett Hall in Strafford to brainstorm current topics of focus for the region. The following topics were identified for further discussion – 1) Economic Development & Cultural Vitality, 2) Affordable Housing & Senior Living, 3) Attracting & Supporting Young Residents & Families, 4) Agriculture and Forestry, 5) Infrastructure, Communication & Municipal Partnership, 6) Recreation, Trails, Environment & Natural Resources, 7) Education, and 8) Addressing Poverty. AVC agrees with Kenneth Blanchard- “none of us is as smart as all of us.” By putting four times the number of heads together, we can better address topics of concern to residents of not only the four towns, but potentially become models for multi-town cooperation in rural Vermont. Please contact us to learn how you can be involved. In June 2018, Alliance for Vermont Communities (AVC) purchased the Ashley property with support from the Vermont Land Trust. The 218 acre parcel straddles the towns of Sharon and Strafford Vermont. The two primary goals for this purchase were to discourage the out-of-scale NewVista development and to create a Community Forest. AVC plans to gift the parcel to the two towns to be used as a regional and community resource for timber, recreation, wildlife, historic preservation and scenic beauty. The Vermont Land Trust (VLT) and Vermont Housing and Conservation Board will be co-holders of the conservation easement. A small group composed of members of the 2 towns conservation commissions, AVC and the Vermont Land Trust are meeting to create a legal and management structure involving both towns in a common, undivided ownership of the parcel. Though there are challenges to creating a community forest that spans two towns (and two counties), town officials and AVC feel optimistic that an innovative model of a multi-town agreement can be forged. We are planning public events at the Ashley Community Forest to introduce are area residents to the Community Forest. Stay tuned to the Tunbridge List Serve and other postings regarding the free public events on topics such as Reading the Forested Landscape, Birding, Ferns, Tree Identification and others. AVC is thankful for support from the Sharon and Strafford communities to make the Ashley Community Forest a living resource for us all. The Third Annual Ranger Gravel-Enduro Bike event and “Party in the Pasture” will take place at the Tunbridge Fairgrounds on Sunday, June 9th. So get a workout on hills and valleys of Tunbridge, then head to town for good (and local) food, beer music and activities for all. AVC will continue to work in collaboration with local and regional organizations, and with residents and town officials from our communities to encourage innovation with developing a new rural economy from land based economies such as agriculture, forestry and recreation.To learn more or to get involved, check out our website or contact Michael Sacca at 889.3210. We are a 501(c)(3) nonprofit. Tax deductible donations are very welcome and can be mailed to: AVC P.O. Box 545 South Royalton, VT 05068 or be made at our donate page on our website; alliancevermont.org. The Tunbridge Church will observe Holy Week, April 14-21, with Palm Sunday, Good Friday, Easter Sunrise and Easter Sunday services. Everyone is welcome. Special choir music will be featured at the Palm Sunday and Easter church services held at 10 a.m. The Good Friday and Tenebrae Service with communion will begin at 7:30 p.m. The Easter sunrise service will be held at the top of Strafford Road at 5:45 followed by hot beverages, juice and pastries at the Parish House. Super Senior Luncheons will resume in April. The Outreach Committee hosts the meals the last Saturdays of April, June, August and October. Residents over age 80 can contact Judy Tucker at 889-3305 for information and a reservation. Local nonprofit groups are invited to set up their display and raffle tables on the Parish House lawn on Memorial Day. For information and to confirm space contact Kay Jorgensen at 889-5528, kjayvt@gmail.com. During spring cleaning time the church is accepting donations of gently used goods and Christmas items for its tables at the July 13 Community Yard Sale. Proceeds from vendor space rentals on the lawn and church tables will go to the capital fund. The Chelsea Health Center recently gave the church a $700 Wellness Grant to allow the Outreach Committee to increase its senior services. As part of the grant, a meal of homemade soup, bread and cookies was recently delivered to seniors’ homes. The Recreation Committee donated proceeds of almost $1,000 from its December breakfast to the Community Food Shelf. The funds were spent for foods for 31 family Christmas dinner boxes. Since January the church has hosted an Italian pasta fundraiser for the Food Shelf, Just Desserts social and silent auction, and a Good-time Gospel Festival of Worship service. A Festival of Worship: Summer Solstice Celebration service will be held June 23 at 10 a.m.
Sunday worship services are at 10 a.m. at the Tunbridge Village church through June. The choir welcomes new members at rehearsals on Thursdays at 7 p.m. The Food Shelf is open Fridays from 4-6 p.m. at the Parish House, across the road from the church. To receive weekly church announcements and the bimonthly newsletter by email contact thetunbridgechurch@gmail.com. At the annual business meeting held Thursday, March 14, Dan Roberts was recognized for his 50 years of exemplary service on the Tunbridge Volunteer Fire Department with a resolution from the General Assembly at the State of Vermont, and presented with a flag that had been flown over the Statehouse in his honor. We appreciate Dan and his continued work and support of the department. Department pins were also given to several members recognizing their years of service: Gary Wight – 5 Years, Mike Morrison -15 years, Simon Bradford – 20 years, Peter Button – 35 years. Thank you to the town of Tunbridge for approving our yearly budget appropriation during Town Meeting. We have a small upcoming repair job on the back entryway of the fire department after snow damaged the entryway awning. The Fire Department will hold its annual children’s Egg Hunt at the Tunbridge School on April 20th at 10AM sharp. Children should bring a basket or pail to gather eggs. Vital Communities hosts a ”ListServ” to foster increased communication among residents from offering items for sale, to services wanted and offered, announcements of coming events, lost and found, and to discussions of community wide interest. To sign up, go to: https://lists.vitalcommunities.org/lists/info/tunbridge then select “subscribe” on the left hand side and type in your email address. All skill levels are welcome to join the Tunbridge Sewing Circle from 8am until noon in the School Library. Upcoming dates include April 13th, May 4th and June 8th. Call Elaine or Nancy Howe (889-3750) for more information, or just show up. What is School Club? School Club is an organization dedicated to providing enrichment activities and services to students, families, staff and teachers at TCS. Anyone can participate and there are no membership dues. How can you participate? School Club provides many opportunities for parents, teachers and community members to connect with one another, share ideas, plan activities and more. We welcome volunteers of all interests and abilities. Skills such as organization management, bookkeeping, fundraising, event planning, public relations, cooking/baking, etc. are helpful. What are School Club funds used for? Last year, School Club provided sup-port for the Back-to-School potluck; movie site license; Grades 1 & 2 “Dairy in the Classroom” field trip to Vermont Tech; student gifts at the holiday concert; the holiday breakfast for teachers and staff; classroom supplies for teachers at the New Year; Winter Carnival; a Teacher Appreciation Week luncheon; flowers and cake for the graduation ceremony and the last day of school picnic. Getting the Word Out: Stay informed about School Club happenings by watching for information sent home with students, the TCS email list, articles on the Tunbridge page in The Herald, and the School Club section inside the Tunbridge Quarterly. Interested individuals can write to tunbridgeschool-club@wrvsu.org to sign up for the email list and receive event details, meet-ing agendas and more. Upcoming Meetings: Parents, school personnel and community members typically meet in the TCS Library at 6:00pm on the first Monday every month from October through June (or a rescheduled date due to a school break, holiday or inclement weather) to plan events, hear new ideas, review funding requests and manage the organization. All are welcome to come share ideas or get involved! Children may come along to do homework, read or play games in the library. a month. Tunbridge needs another volunteer to step up and join this worth while effort. Please contact Henry if you are interested in learning more about getting involved. The Fuel Assistance Committee was formed to find ways to ease the burden of fuel costs on Tunbridge residents. We started by creating and overseeing a Fuel Loan Assistance Fund, formed as a no-interest revolving loan fund, and composed entirely of donations. Since our formation, the Committee has gotten familiar with other fund sources that residents can use for purchasing fuel; we ask residents to apply for these resources first before they apply for a loan through us. We are able to point anyone interested to the seasonal fuel assistance from the state of Vermont, and we can connect you with Capstone Community Action for crisis fuel assistance. Recently we have connected to a regional Energy Advocacy Council that is finding ways for communities and institutions to address the real challenge of heating that leaves many choosing between heat and other necessities. You can find the Fuel Committee’s resource packets at the Town Clerk, the Library, or the Food Shelf to learn more about the resources available, including the loans from Fuel Assistance Fund. To contact the Fuel Committee reach out by phone (at 802-738-6570), or by email: tunbridge.fuel.assistance@gmail.com, or you can send letters as well as tax-deductible donations to: the Tunbridge Fuel Assistance c/o Town Treasurer; P.O. Box 6; Tunbridge, VT 05077. The Committee welcomes your feedback, your ideas, and your elbow grease, which we’ll need in such efforts as our initiative to start a wood bank. Our next meeting is tentatively scheduled for Thursday, January 10 at 6:30 pm at the Library’s Community Room. Stay warm, and make sure your neighbors are keeping warm, too! Happy Holidays from The Friends of the Fair! What a Fair! With the warm weather and high rate of attendance we transported a record number of fairgoers in 2018. That number continues to rise every year as more people learn that this service is provided free to help people to move around the grounds, as well as to aid those leaving the grounds to head home. This Fall the Friends were recognized by the Vermont Council for Independent Living for helping to make the Fair more accessible. It was exciting to find out that people notice and appreciate our efforts! Projects completed for the 2018 fair included providing safety equipment for the security team and lighting and matting in the ox barns. We have several new projects in the works for 2019 and are always looking for ways to improve the Fair experience for exhibitors and attendees. We have meetings the 2nd Wednesday of the months of May through November; anyone who would like to attend is welcome. For more information please contact Deb Mullen. The Tunbridge Walking Group was loosely organized in November 2011. We have continued to walk three times a week since that time. We walk Tuesday, Wednesday and Thursday mornings at various locations in Tunbridge, meeting at 9:30 for about an hour or sometimes a little more. Not everyone can make it every day, even once a week for some. We have lost and gained walkers, however, our numbers remain consistent. Three of us are tasked with setting up a monthly schedule. We have logged many miles, some great hikes, and in the winter snowshoe or cross-country ski. The terrain varies, however, there is something for everyone. Anyone is welcome to join us. You do not have to live in Tunbridge. Contact Maxine Young to be added to our e-mail list. This is a great way to begin or maintain a healthy lifestyle, lower blood pressure, lose weight, lower cholesterol numbers, deal with stress, better breathing and the list goes on. The transfer station open on Saturdays from 9 a.m. to 3 p.m. (Wednesday hours have ended until May). Follow this link for more information.